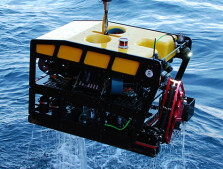 The goal of this leg is to sample benthic animals from deep-sea hydrothermal vents and hydrocarbon seeps in the Gulf of California. 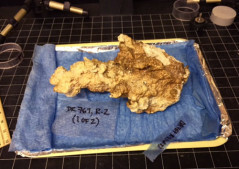 The sample benthic specimens will be used for taxonomic purposes to establish depth and geographical ranges of individual species, and for population genetic studies of connectivity along the western margin of North and Central America. These data will inform scientists and managers interested in maintaining preserves and creating new protected areas. 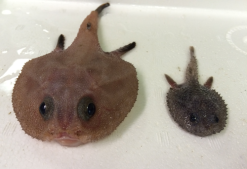 This leg’s researchers will focus primarily on the bivalve and gastropod mollusks, annelids, and crustaceans associated with chemosynthetic habitats. 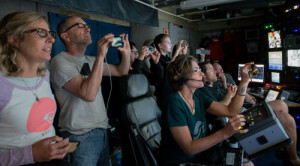 A main target will be the hydrothermal vents discovered during the 2012 expedition. 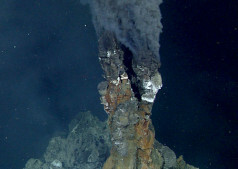 They also plan to explore and sample vents that are still to be discovered in the Pescadero Basin (east of La Paz). Today we returned to Pescadero Basin, which is, undoubtedly, an exceptional place that we had to revisit with its active chimneys and mounds, and the rich biodiversity they nourish. Today we finished the last dive of Leg 6. It was a productive day and it started somewhat auspiciously. The wind was blowing close to 20 knots at 6:00 a.m., just before launch time. Would it increase or decrease during the next half hour? 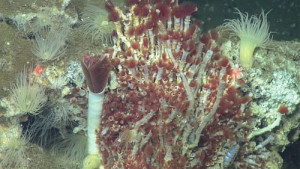 Vesicomyid clams are conspicuous and consistent members of hydrothermal vent and hydrocarbon seep communities worldwide. Nevertheless, they remain one of the most poorly understood bivalves. Today is Earth Day, a perfect day to be afloat on the surface of the ocean, exploring the deep-sea communities thousands of meters below. Over 70 percent of Earth’s surface is covered by oceans making the seafloor one of the world's largest habitats. 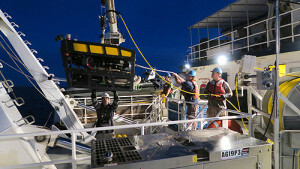 6 a.m.: Time to get up to watch the launch of the ROV Doc Ricketts in 30 minutes. 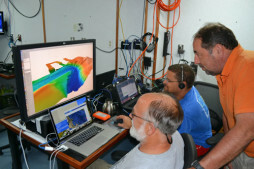 It will take about 1.5 hours for the ROV to reach the seafloor and allow us to take another glimpse at the mysterious world of deep-sea vents in the Gulf of California. Today was an amazing day of exploration and discovery at one of the most exciting natural habitats of the deep sea—black smokers. We explored enormous hydrothermal vent chimneys, majestic columns eight to 37 meters tall, emitting voluminous plumes of black smoke. Today we returned to Pescadero Basin to continue exploring the active mounds and chimneys in the area at 3,700 meters depth and to document and collect various animals. 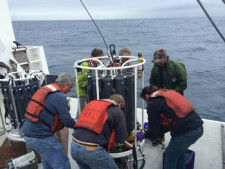 These biological collections are important as they will allow us to compare vent systems further south on the East Pacific Rise with those further north in the Guaymas Basin and may also result in the discovery of new species. Nestled in a very deep valley in the Gulf of California lies what we’ve called the “Mermaid Castle” where tubeworms and anemones sway in the wafting warm waters. Well, it did look a bit like a fantasy land to us! At 7:03 AM, we set sail on a cool overcast day from La Paz, Mexico, aboard the R/V Western Flyer. The 10 scientists onboard all specialize in various aspects of deep-sea biology, ecology, evolution, taxonomy, and microbiology.